Mount Tampa stands tall at a height of 955 meters above MSL and overlooks the entire town of Brasov complete with the historic building fading into the 18th and 19th century structures. The mountain has hiking trails that offer a chance to see the rich flora and fauna around the city. Most people prefer taking the cable car (an attraction in itself) that offers a surreal view of the city’s skyline and the mountains but if you truly love nature, take the moderately difficult pathway to reach the top. The ride itself takes you to an altitude of 940 meters and serious hikers even hike from the summit to the neighbouring Poiana Brasov and Postavarul. The lush greenery does have its own charm and if you really are a nature’s child, take some time off here to breathe the fresh air, admire the view and feel one with the mountains! The mountain is home to brown bears, Eurasian nuthatch, boars, butterflies, lynx, Ural owl, woodpeckers and is perfect for bird watching or simply to explore the rustic side of the city. During winters, a hike to the mountain is spellbinding and the view from the summit, is simply other worldly! Carry bottled drinking water and wear study shoes if you want to hike to the mountain top. We climbed there at midnight which was amazing. I suggest it to everybody but without right equipment its dangerous. And it takes alot to go there even if it rains it will be slippery and you won't remember it as a good adventure. When we reached up there was a traveller guy alone trying to sleep there. That time I understood that I am not the crazy one. It was really tiring to climb up but when you see the city lights from up there at night its definitely worthy. 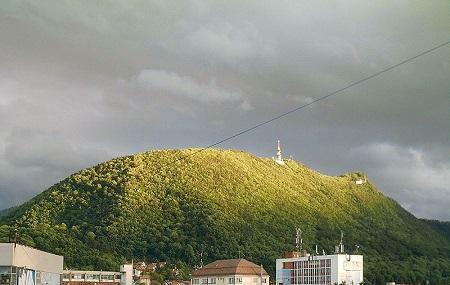 Has a beautiful view above Brasov. Great view from the top there is the cable car but you can hike about 1 hour to the top. Best place for a panoramic view of Brasov. You can choose various ways to reach there. There are some beautiful and marked trails. You can walk and hike. Or you can try the easy way, using the cable car. Nice view of Braşov. Easy to hike on Tampa peak.